One of the best things about colder weather is all the wonderful Winter vegetables. 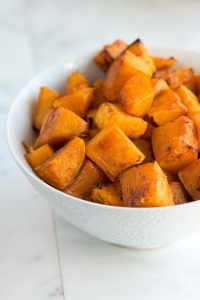 Butternut squash, acorn squash, sweet potatoes; they are beautiful and delicious. Here is a really quick and easy recipe that has a bit of heat to warm up your cold nights. Place the vegetables in a zip-top bag and add all other ingredients. Turn out onto a baking pan or pizza pan that has been lined with foil and sprayed with non-stick spray. Bake at 375 until the vegetables are tender and have a bit of color. This is great warm from the oven as a side dish. You can also top it with an over- medium egg for a main dish. OR cool, it can be used as a salad ingredient, mix with arugula and balsamic vinaigrette.